Some of my favorite restaurants near my school are Mexican places. People often think of Mexican restaurants as being not so great for you, but there are actually lots of ways to make healthy choices at them. I really like some local Mexican spots, but I also love places like Chipotle since you can design your meal to be exactly the way you want it. Chipotle’s my favorite chain restaurant by far! -Load up on as many healthy toppings as you can- sautéed fajita veggies, tomatoes, spicy salsas, etc. -Skip sour cream and cheese. They’re high in calories and while cheese is a pretty good source of protein, you’re already getting lots of protein from your meat and or/beans. With everything else going on in your meal, you won’t miss them! (Or, if Mexican food without sour cream and cheese sounds like a world without happiness to you, order them on the side and just use a small amount. -Skip the tortilla. Giant restaurant tortillas made with white or corn flour don’t have a lot of nutrients to offer. Instead, go with a burrito bowl with a brown rice base or a salad with a lettuce base. -If you order a salad, skip the salad dressing and use salsa or guacamole instead. Salad dressings are typically really high calorie without many nutrients, and again, you won’t miss it! -When you order a big entree, bring half of it home. You’ll save money by making it into 2 meals, and you won’t eat so much that you go into a food coma. Plus, eating Chipotle for 2 meals > eating Chipotle for 1 meal. 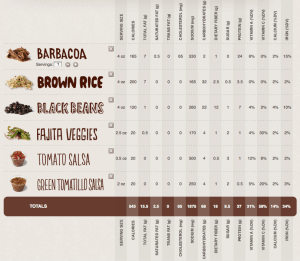 -If the restaurant has nutrition info online, it can be helpful to look at if if you’re not sure what to pick. 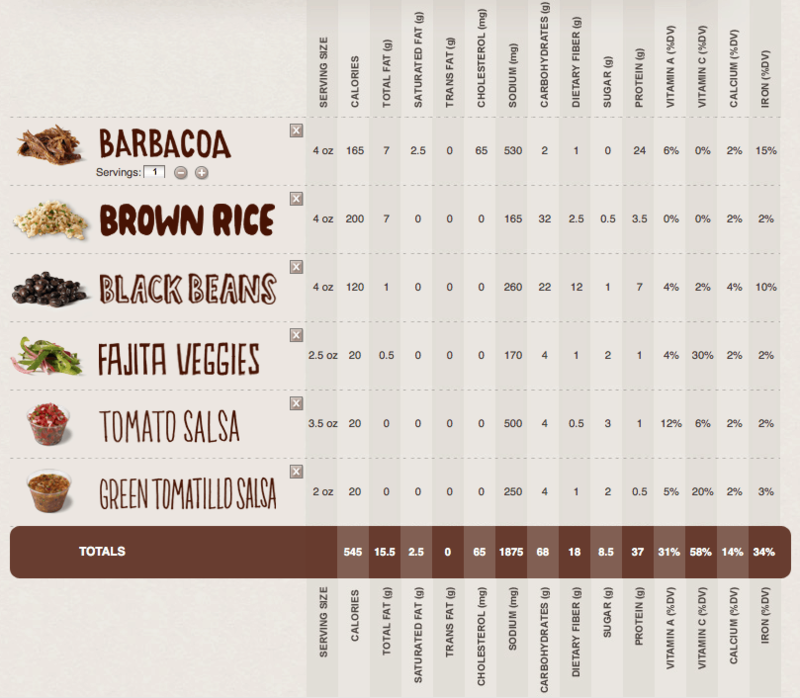 Chipotle has an awesome meal calculator that lets you plug in exactly what you ordered to see the stats. 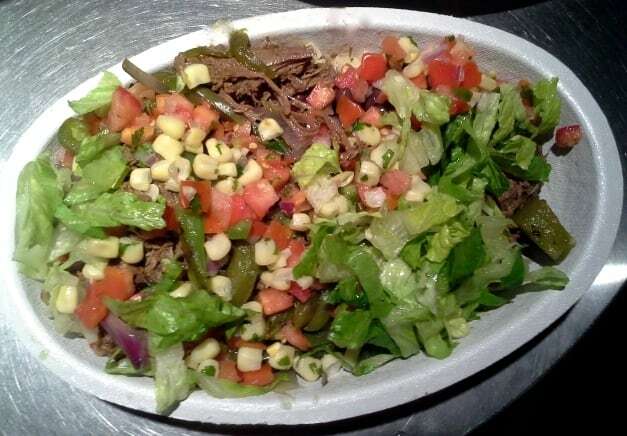 I went to Chipotle with friends this past weekend and here’s what I got: a burrito bowl with barbacoa (spicy shredded beef), brown rice, black beans, fajita veggies, tomato salsa, and green tomatillo salsa. ~545 calories, 37 grams of protein, 18 grams of fiber. Great stats for 1 meal and if I’d been really hungry, I probably could’ve eaten the whole thing. Since we were planning on getting ice cream after, I ate a little over half of it and saved the rest for lunch the next day. I used to always get a salad and eat the whole thing (same thing but with lettuce instead of rice), but in college, leftovers are awesome. Depending on your calorie needs, you could get a lettuce base instead of the rice (- 200 calories). Or, if you’re like Michael Phelps (or my teenage brother with a metabolism faster than the speed of light), you could add in the tortilla (+300 calories), guacamole (+ 200 calories), cheese (+100 calories), and/or sour cream (+115 calories). *Side note: I think it’s great to indulge every once in a while when you go out! But when eating out is almost a daily occurrence, I try to make healthier choices as much as possible, especially at places where you can easily customize your order. Questions: Do you like Chipotle? What’s your normal order? P.S. 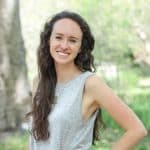 I just started a Twitter account (livbane) and I’d love to follow you! You can find me with the button below this post or comment with your Twitter handle or any people I should definitely follow. I love Chipotle! Sometimes I’ll get a burrito, but they’re huge, so usually I stick with a rice bowl with chicken. Love this post! Hey Ashley! So glad you liked the post. Thanks for reading!! 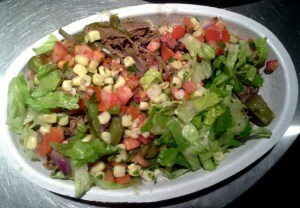 OMG love chipotle..understatement! Being a vegetarian I get the same thing each time which sounds kinda boring I’m sure but I wouldn’t have it any other way..well if they added some Beyond Meat to the menu I would be stoked!! They do have sofritas which I did try but although I do like spicy stuff, I don’t NEED to have sofritas to make my meal, tho my hubby does like it. I always get a veggie bowl with white or brown rice, black beans and X black beans, corn salsa and maybe top with lettuce depending on my mood lol. Then it’s nothing but D-E-V-O-U-R!!!! Now you’ve got me craving Chipotle! It’s the best!